Onlookers in Gravesend take in the standoff. 40 years ago today, John Wojtowicz and Salvatore Natuarale tried to rob a Chase Manhattan bank branch in Gravesend. 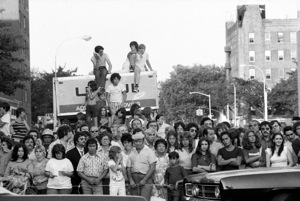 The Times has and excellent post and archival slideshow on the resulting standoff.